It’s important when editing your work to detect inconsistencies in word use. As I am revising my backlist titles, I am coming across several of these instances. One way that you can help avoid them in the future is to create a style sheet. Sometimes your publisher does this for you. Or you can note down observations yourself to make sure you follow through during the editing phase. Two words or single word – town house or townhouse; coffeemaker or coffee maker, nightstand or night stand? If you have different publishers, each one will have their own preferences. But if the editing is up to you, choose one way to list your word(s) and stick to it. Don’t know which one is correct? Look it up in your favorite grammar text. And if both are commonly used, choose the one that suits you and use that one on a consistent basis. Wine types – Chardonnay or chardonnay? I’ve seen this done both ways. Whichever you do, be consistent for all wine varietals. Character names – Chris or Christine? Jan or Janice? In my recent book that I’m editing, I noticed that sometimes I referred to a character by her full first name and at other times by her nickname. This can be confusing for the reader. We’re reading about Jan through several chapters, and then there’s a Janice who shows up. Who’s that? Best to stick with one rendition, unless you happen to be giving the person’s full first and last name together, like in an introduction. If your guy is always calling the ladies “babe” then don’t have him switch suddenly to another word. It’s part of his characterization to use that one term. Foreign words – chutzpah or chutzpah? Decide if you are going to italicize the foreign word or not, and then be consistent throughout the story. Hyphenated words – hard-boiled eggs or hard boiled eggs; fund-raiser or fundraiser? Again, this can be a publisher choice. If not, look it up to see what’s correct or make your own decision about the hyphen. Whatever your word choices, be consistent as you edit your work. Keeping a style sheet will help you remember which word to use. Enter Now to win a Samsung Galaxy Tablet in Booklovers Bench anniversary giveaway. When editing your fiction manuscript, one thing you must watch out for are word repetitions. This might be a favorite word you overuse, or it might be a specific word or phrase that you use twice in one paragraph. You want to clean these up so they don’t pull your reader out of the story. “Very much in charge.” Chris wore flashy clothes to attract attention, Marla wanted to add, but she bit her lower lip instead. “Not really, and she appeared to be perfectly healthy,” Marla said, anticipating his next question. In this passage, note how many times I use the word SO. It is a favorite word of mine in conversation, too. Currently, I’m revising my backlist titles. This book had already been through several rounds of edits at my former publishing house and through my own multiple read-throughs at the time. How come I picked up on this now? Maybe because I’m more aware of this word’s overuse. Whatever the reason, it popped out at me this time. Marla saw what she meant. Her stomach sank as she realized the significance. Somebody had taken the valuable Fabergé egg and substituted a fake one in its place. A software program that will help you pick up on word repetitions is Smart-Edit. Otherwise, you can do a search and find if you’re aware of your foibles in this regard. If not, a close edit of your manuscript may turn them up. Setting goals is critical if you want to get things done. For a writer, making a list of what you want to accomplish each year will put you on the right path. In an earlier blog post, I reviewed my goals for 2018. We discussed what got done and what didn’t. Authors can break down their goals into creative and business oriented tasks. So now let’s take a look at 2019. This might seem less ambitious than last year, but revising and reissuing my backlist titles is my main goal. That project could take the entire year, because I go through each book to tighten the writing and then do a full read-through once for any further changes and again to check for conversion errors after formatting. It takes time, because I want each book to be the best possible version. So I am not going to set myself too many tasks beyond this one. Five years ago, I wrote a list of long-term, five-year goals. I am pleased to say that I am on target with most of these items. Once this year’s goals are met, it will be time for a career reassessment. Only by resetting our overall goals periodically can we gain clarity on the best path to take next. What is the main item you want to get done this year? Enter to win a $25 Amazon/BN Gift Card at Booklovers Bench. Do you want to send an agent a query letter but have no idea what it should include? Or perhaps you’ve sent out several queries and you keep getting rejections. What could you be doing wrong? Here are some steps you can take to put yourself on the path to success. · Check the guidelines for submissions on the agent’s website. This will tell you what genres the person represents and if they prefer email or snail mail submissions. The guidelines will also state if you should include any sample chapters. · Make sure the agent does not require an exclusive submission. If so, you’d lose months while waiting for a response. See if the agent mentions their expected response time. · Write a one-page snappy query letter introducing yourself, giving the word count and genre for your book, a catchy story blurb, and your writing credits. If possible, include a hot premise or marketing hook that makes your story stand out. This means using keywords such as “paranormal” or “dystopian” or “domestic suspense” or saying your story is “Indiana Jones meets Romancing the Stone.” If you can compare your style to similar published authors, do so without bragging about how your book is as wonderful as Ms. Bestselling Author. · Be careful not to sound as though your writing is all over the board in terms of genres. Be clear about your focus. For example, don’t give the genre as a suspense novel and then mention that it takes place on another planet and your next book will be a vampire story. You’ll want to build your author brand by focusing on one genre as you grow your readership. · Do not describe your life history or any personal details unless they relate directly to your book. Do include if you belong to a critique group, have won writing contests, or if you’ve attended writing workshops and conferences. · You can also mention why readers might want to read your book. What is the value in it for them? Again, don’t brag and say it’s the most exciting book they’ll ever read, or it’s a fast-paced thrill ride. This is for readers to determine. But if it helps them appreciate family values or learn about how you can rise above past mistakes, this could be useful to include as a theme. First Paragraph – State your book’s title, genre and word count. Here you can put if you’re a published author seeking representation or a new author seeking an agent for your first book. Second Paragraph – This is your catchy book blurb. Write it like a log line for a TV show or like the back cover copy of your book. You’ll want to engage the reader’s interest. Third Paragraph – Here offer your biography as it applies to your writing, including works you’ve published, memberships in professional writing organizations, writing workshops you’ve attended, critique group participation. Mention any expertise or work credentials that apply to your book. You can also make marketing suggestions or mention your proposed target audience. Mention if your story is book one of a series. Last Remarks – Thank the agent for their consideration and offer to send the completed manuscript upon request. Do mention if this is a multiple submission. Signature Line – Here is where you can add your social media links. Doubtless the agent, if interested, will look you up to see if you have an online platform. If you hear nothing back from the agent for a couple of months, send a follow-up email to ask if she’s received your query. Be courteous and respectful of the agent’s time. Be aware that some agents won’t respond at all, and this can be taken as a rejection. But follow through at least once to make sure your email was received. As an alternative, you can request a return receipt for when the agent opens the message. If you receive a rejection letter with detailed suggestions for your work, write a thank you note. Remember, an author-agent relationship is a two-way street. Just as you want to hire the ideal agent, the agent wants to land the ideal client. Be courteous, professional, and savvy about the industry. Also respect that while the agent might offer suggestions for improvements, this is not an invitation to resubmit your work unless the agent says so in her response. Enter Here Dec. 1 – 15 to win a signed hardcover of Peril by Ponytail by Nancy J. Cohen along with a DVD of “Author’s Anonymous” and a bag of microwave popcorn. Two Runners-up get either a signed paperback of Shear Murder or Hanging by a Hair. Enter Here Dec. 1 – 18 to win a $25 Amazon/BN gift card from Booklover’s Bench. Your main goal in writing a mystery, or any kind of fictional work, is to create story questions in the reader’s mind. This creates suspense that you need to propel the story forward. Even as you are plotting the book, assuming you’re a plotter like me and not a pantser (figuring it out as you go), you need to keep asking yourself ongoing questions. Let’s take a story I have in mind as an example. The setting is a historic house. Suspects may include the head docent, the owner or owner’s children, a board of trustees if they own the place, the gardener, café manager, and gift shop lady. Objects are being stolen from this house one at a time so the theft won’t be noticed. So here we come to several questions. Why is someone stealing valuable objects? The thief needs money. What for? Or the thief is stealing out of a sense of entitlement. The culprit feels these items should be rightfully his because the former owner (a distant relative?) swindled his father out of his inheritance. Or was his father cheated by a business partner, the former owner of the estate? Note that you can assign one of these motives to each suspect without deciding which one is the killer. It’ll make them all seem guilty. Next question would be: Who has access to the house? This could be any of the above named suspects, plus the cleaning staff, repairmen, or other minor players. So the thief steals these items. How does he sell them? Does he go through a person acting as fence? If so, how did he gain this criminal connection? Has he been incarcerated, which is where he got the idea for thievery and learned these skills? Or maybe the culprit is a woman lonely for attention who’s been seduced by a bad boy? What about security? Are the valuable items in locked display cases? Is there video monitoring, motion detectors, glass-break alarms? Or are the objects in plain sight in various rooms guarded by security personnel until closing time? Now we come to the next big question. Who is killed and why? Did the victim witness the thief in action? Maybe he saw the crook hand off the item to his fence in exchange for a wad of cash. Or he stumbled into the culprit and the stolen object tumbled from the thief’s jacket onto the ground. Either way, this appears to be a crime of opportunity. The sleuth finds the body. What is the means of murder? Where does she find the victim? Let’s say the sleuth also discovers one of the stolen items on the estate grounds. How does it get there? Did the thief mean to get rid of the evidence, or did the item fall from his pocket accidentally? Now let’s turn everything around. Thefts have been taking place at this estate, and the suspects all seem to be hiding these secret motives we’ve discussed. But what if the victim’s death was premeditated? The autopsy reveals that this act was set in motion even before the day’s events began. He died from poison, not the knife wound. Plot twist! Now your sleuth has to reexamine all the motives, the access to the victim, and the specialized knowledge needed to commit the murder. If you’re a mystery writer who likes to plan things out in advance, you need to answer all these questions before you begin writing the novel. You might be a pantser who starts with a story crisis and keeps writing, being surprised along the way. But as you can see, a plotter can be surprised as well when these plot twists pop up. I call this process story magic coming into play. The point is to keep asking questions. These same questions will plague your readers, and that creates suspense. When one issue is settled, you’ll need to raise more questions to keep the tension going throughout the book. Enter Here to win 30+ Women Sleuth Mysteries, including my book HAIR BRAINED, along with a new eReader. And you get FREE reads just for entering! 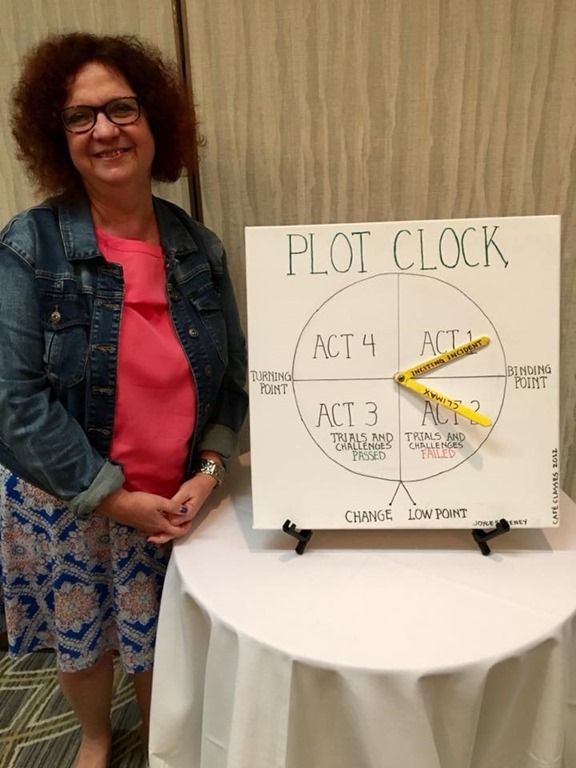 This past weekend, writing coach Joyce Sweeney gave a workshop on The Plot Clock at the August meeting of Mystery Writers of America Florida Chapter. You can sign up for a webinar on this topic at her website: http://www.sweeneywritingcoach.com/. Here’s what I learned. Any errors are due to my misinterpretation. Start with this question before you begin plotting: What will happen to your protagonist so he has to change and transform? 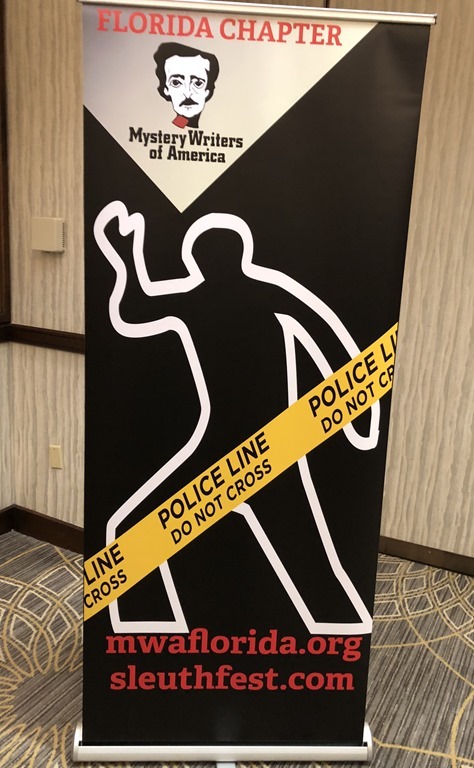 In a mystery, how will the murder challenge your main character? Act One of this four-act structure includes the Inciting Event. The person who doesn’t want to change meets an event that will cause him to transform. At this stage, he is reluctant to get involved. He fights against the inevitable until something compelling happens that he can’t avoid. This is called the Binding Point. Act Two finds the hero entering the special world of the story. In a mystery, this is when the sleuth commits to solving the crime. But the protagonist hasn’t changed yet and makes mistakes. Things go badly for him. As a writer, ask yourself what’s the worst thing that can happen to this character? He keeps losing ground and struggles to carry on until he reaches a Low Point. This happens in the middle of the book. In Act Three, the hero determines to improve and fight on. By doing the right thing, he gains ground. He may have followed the wrong path and has changed direction. Now he is on the proper trail. But we still need to escalate tension. As the protagonist gets closer to identifying the murderer, the bad guy reacts. More deaths may occur. Attempts on the hero’s life might threaten him. The sleuth is doing better at solving the crime, but the killer is now on to him. For every action the hero makes, the villain makes a countermove. The Turning Point comes out of left field and moves us into Act Four. Nobody could have anticipated this plot twist. It derails the main character so that he questions his purpose and wants to quit, or “turn away.” Here you must raise the stakes so he can’t quit. He rallies and “turns back” to solve the mystery. The Climax comes close to the end. You should be layering in the explanations about the suspects’ motives so the Denouement is short and doesn’t drag on. Writer’s Block is often interpreted to mean that a writer stumbles over what to write next. Or he comes to a complete halt due to outside distractions or loss of confidence. But what about when he has so many ideas, that he can’t complete a single one? This can be conceived as another type of writer’s block. It’s great if you have lots of story ideas. It’s not so good if you allow them to distract you until you can’t write anything. Or maybe you’ll write a bit on each one but never finish a single novel. My suggestion would be to pick the one idea that excites you the most and keep writing until you finish the first draft. Yes, it’s that simple. I can only work on one project at a time. Even when I was writing two series in different genres, I would focus on one book until it was finished and in the hands of my editor. When that book was completely done, I would turn to the next project. What happens when you have so many ideas that they interfere with your concentration? Write them down. Keep a “New Idea” file or a “Plotting” file and jot down your notes. Then put them aside until you finish your current project. 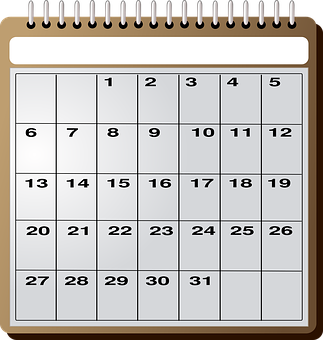 · Set your writing goals. · Write down all the distracting ideas in your head and set them aside. · Begin on your daily writing quota. · Keep writing until you finish the first draft. Next come revisions, and that’s another topic we’ve already addressed here. Your book isn’t done until it’s done. Edited, Revised, Polished, and Submitted. Then and only then, you may turn to your list of potential new projects. If you’re writing a series, you will need to begin the next installment. If not, listen to your heart and determine which idea is calling to you. Your passion will shine through in your words. Have some ideas that don’t resonate anymore? Scratch them off the list. You want to be excited enough that the buoyancy will sustain you throughout an entire novel. One idea at a time. One day at a time. One page at a time. Enter Here to win a $25 Amazon/BN gift card from Booklovers Bench. You’ve read through your novel for the umpteenth time and can barely look at it anymore. Then your advance reading copy or final pdf file arrives, and it’s time for a last glance before sending your baby into the world. Will you still find changes to make? Undoubtedly. Sometimes these are conversion errors. Or you may notice typos or word choices that need a tweak. Trimmed to Death, #15 in the Bad Hair Day Mysteries, is set to debut on Sept. 25. Check out the latest changes I’ve made and you’ll gain some insight into the mind of a writer. Caution – There may be spoilers. p. 74 – bustled … bustle. A few minutes later, Janet bustled down the stairs along with her housekeeper. After giving the woman an order and watching her bustle off toward another part of the house, Janet turned to Marla. Change “I’d love to get involved” to “be included.” So it should say, I’d love to be included. p. 103 –Marla winced. “I know what you mean. I’m wondering if you knew Francine Dodger, publisher of Eat Well Now magazine. Delete “Marla winced” on this line. I use “wince” too many times. Last quote mark is reversed. p. 154 – “Why are you so afraid, Janet? p. 165 – “Lynette theorized that Francine would have made an effort to buy the magazine from the conglomerate that owns it. Made an offer, not made an effort. Change effort to offer. Marla’s jaw dropped as she noticed the variety of goods for sale. p. 178 – Used “message” x 3. Chills ran up Marla’s spine as she scanned the message. Mind your own business or you’ll be next. “It looks as though the message was printed on a sheet of white computer paper.” Marla snapped a photo and messaged it to Dalton. Change “messaged” to “sent” in this last sentence. p. 180 – The word “property” is used too many times. p. 199 – Used “man” x 3. “Could he have wanted to get her out of the way?” Dalton studied the other man’s face. Remove this “Man” and just say, “That guy couldn’t hurt a fly. p. 204 – She could have quite a list of personal indiscretions hidden away. Change to: She could have had quite a … Add “had” in this sentence. This refers to the victim. Change to, Do you believe the killer kept it? Meanwhile, it promised to be a bumpy ride. Dalton likely wouldn’t approve of any guy she brought home for them to meet until he’d done a thorough background check and conducted a personal interview. She couldn’t blame the girl for being guarded about her love life and had to trust her to make the right decisions. Change “she” to “Marla” in the beginning of this sentence to clarify: Marla couldn’t blame the girl for being guarded about her love life and had to trust her to make the right decisions.